In today’s production agriculture, the increasing need for good soil testing or soil nutrient information is a critical foundation for intensively managing crop inputs. 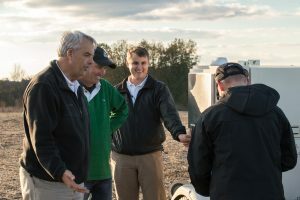 We are pleased to work with the American Society of Agronomy in sponsoring an event that puts into focus the characteristics of different soil sampling strategies and how to use them effectively in improving our crop fertility programs. Please check out this webinar – Probe to Prescription-Successful Soil Sampling in a “Big Data” World. The event will run live on Tuesday, July 12, 2016. It is conducted by the American Society of Agronomy with sponsorship from Falcon Soil Technology. Continuing Education Credits are available for Certified Crop Advisors (CCA).